The process of laser cutting involves creating a vector path for a high powered laser beam to follow, and results in the laser burning away the material to create to a design. Depending on the strength of the laser, the effect can be a complete cut through of the material or partially removing the surface, known as Engraving. Both results are wonderful and can be applied to a variety of different designs and objects, to create bespoke artwork, signage, ornaments, models, stationery, glassware, ceramics...the list is endless! We recently decided to expand into custom laser cutting and have made a recent addition to the Studio! Having worked in a few different studios on a variety of laser cutters, we choose an Epilog Zing 24 laser cutter & engraver, pictured below, as its the best! We are now able to offer bespoke laser cutting and engraving services with a variety of materials including clear & coloured acrylics, Plywood, MDF, Aluminium, Leather, Cotton, Card, Ceramics & Glass to name a few! The Zing has a bed size of 600mm x 300mm ( 1'-11 1/2" x 11 3/4") and can cut material up to 6mm (1/4") thick. It can also etch onto objects of up to 100mm deep. We also offer a custom drawing service, tailored to meet your design needs while creating complex files that the laser can read. It is essential that all lines weights & colours in your vector file are correct, in order for the laser to decide which lines to cut & which to engrave. We suggest using a programme such as Adobe Illustrator, CorelDraw or AutoCad to create your file, and exporting it as an .AI or .EPS or .DWG file. The physical page size will need to be 600mm x 300mm to match our bed size and allows us to ensure that the scale of the file is correct when we receive it. Please try to ensure that the design within the file is slightly smaller than 600mm x 300mm, so that we can ensure no rough edges from the material become part of your design. We suggest leaving a 5MM BLEED BORDER AROUND THE EDGE OF THE FILE. The colour mode of the file needs to be RGB. This is very important as we use a program that works with RGB values to either cut or etch the lines in your design. Illustrator file with RGB colour mode on. Lines with RED 255 colour value will be CUT. Illustrator file with RGB colour mode on. Lines with BLUE 255 colour value will be ENGRAVED. Shapes will BLUE 255 FILL will be ENGRAVED WITH A FILL. The file size is 600mm x 300mm, RGB colour mode. The design within the file sits within 5mm from the edges. Any lines to be CUT have the RED RGB value of 255 (see image above) and need to be drawn with a line thickness of 0.01pt, with no fill. Any lines to be ENGRAVED have a BLUE RGB value of 255 (see image above) and have a line width of 1pt. These objects can just be an outline (no fill) or have a fill, depending on whether solid etching is required or just an etched outline. Please note that to solidly etch an area, it takes a lot more time than a simple outline, therefore will have an impact on cost. Any text in the document has been Outlined/ Converted to paths. If this is not done then text will be converted to our default text in Aerial. Document exported to .AI or .EPS or .DWG file. Email your design file to us at hello@studio-m-design.co.uk, with material specified in the email. We will endevour to return to you within 24 hours with a quotation. This file contains 3 types of line. A RED cut line (Colour value RED 255, 0.01pt thickness), a blue etch line (Colour Value BLUE 255, 1pt thickness) and blue etched shapes with fill (shapes are text converted to paths, with colour value BLUE 255 and fill on, no outline). Please ensure that your design is 290mm height maximum, to ensure it fits onto material. This design will be cut from 3mm thick sustainable plywood, to make a wooden sign for exhibiting. Illustrator file in RGB colour mode. Here is the final product using the file on the left. You can see the result from the different types of lines and fills and can use these rules to create almost anything on your design! We have a small stock of materials including 3mm & 6mm Plywood, MDF, 3mm & 5mm Clear Acrylic and 3mm coloured acrylic. Please state your desired material when you send your design file to us and if we don't stock that particular material, we will order it in for you. Laser cut signage in 3mm sustainable birch Plywood. We also offer a design service to create drawings ready for laser cutting. 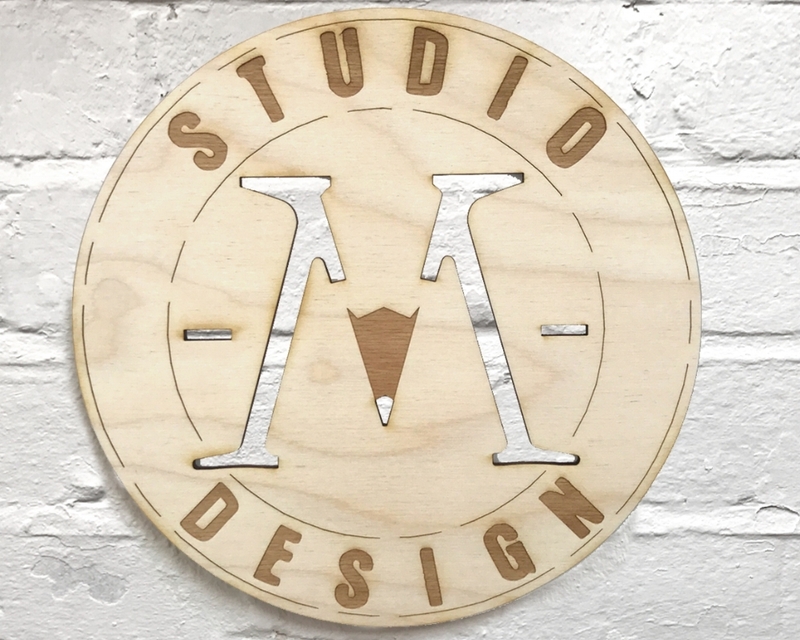 Please drop us an email at hello@studio-m-design.co.uk or call Emma on 07941 079379 regarding your projects and we will create a personalised quote for you!